This has to be one of the coolest stadium seat cards I have ever owned. And now that Yankee Stadium is no more, it is even cooler. How Far Would You Go For Vintage Cards? Hopefully not this far! According to an article on Sports Collectors Daily, a 28 year old man was arrested and sentenced to prison for attacking a sports card dealer in Pennsylvania with a crowbar and stealing $47,000 worth of cards. He was out of prison on parole from a previous offense at the time. And you thought overgraders on eBay were bad! Would You Pay $1 Million For This Card? I ran across this auction and it truly amazed me. Granted, this card is autographed, but I'm thinking $1 million may just be a little high for this particular card. The description is good for a few laughs though, and be sure to check out the questions/answers below the description. They may give you a few laughs as well. So what card would command a million dollar asking price? Take a look for yourself and decide how much you would be willing to pay for this card. There is a "Best Offer" option! Anyone Want Some Babe Ruth DNA? I ran across another amazing card on eBay the other day, a 2008 SP Legendary Cuts Babe Ruth Hair Cut Signature card. It is a 1/1 card and contains both a cut signature of the Babe and a strand of hair from the Bambino himself! I wonder how they got the hair and why Mr. Ruth signed something that has the word "Shoes" printed on it. The seller has a "Best Offer" option on the card, but don't expect this beauty to go for a firesale price. If you are a Babe Ruth collector though, this is a pretty unique card. Check out the link to view more details about this card. 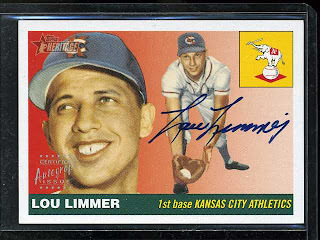 The "Holy Grail" of sports cards has hit eBay. That's right, the T206 Honus Wagner card. And this is not your usual scam either. 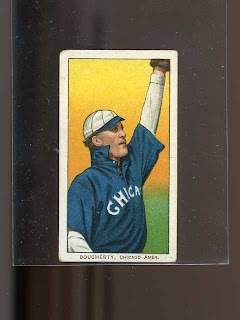 The card is a well know example of the Wagner card, is graded by PSA and is for sale by a reputable dealer. The T206 set is one of my all-time favorites, but unfortunately the asking price is a little high for me at this time! Take a look at this beauty of a card. 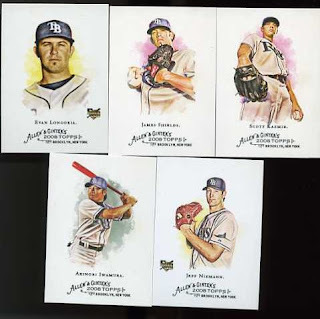 If you follow Topps Heritage much, you are probably aware that Topps just released the 2008 Topps Heritage High Numbers set, a follow up to the 2008 Topps Heritage set. 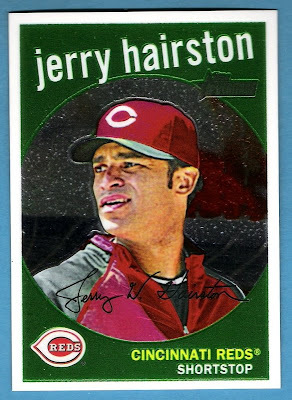 What you may not realize is that for the past month, there was one card most people thought did not exist...the C285 chrome Jerry Hairston card. Several of the refractor versions have shown up on eBay, but no regular chromes. Until a few days ago. One popped up with a buy it now of $10,000 but the auction was pulled by the seller. Now a second has appeared, and is going as a standard auction with a 99 cent starting bid and no reserve. At the time of writing this, it is already over $50 with more than 6 days to go until the end of the auction. How much is it at now and how much will it end up at? Here is a link to the auction to find out. This one should be very interesting. 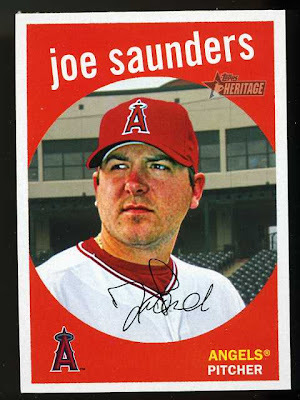 Saunders the red-nosed starter, you'll go down in history (with 17 wins and a 3.41 ERA in 2008). Oh yeah, pick some sunscreen! 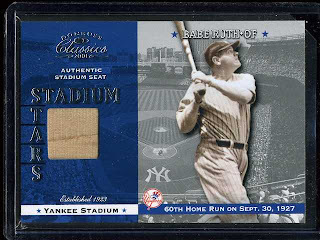 Babe Ruth Card for A Buck? Good luck if you decide to try to win any of these items! When I won an auction for some 2008 Topps Heritage short prints a few weeks ago, I knew I got a good deal. 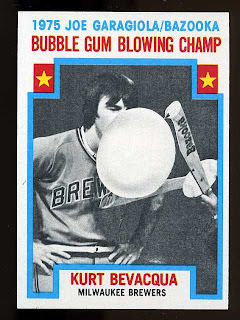 But I did not count on the bonus of the the Topps Heritage cards being packaged just like your average neighborhood kid from the year 1959 who collected cards would store his or her cards. Now tell me this does not bring back some memories. The Paul Mitchell Report that is. Ran across this video and thought it was pretty funny. Congrats to the City of Brotherly Love! It says it is a World Series team signed jersey in the description, but the description does not state if it was actually worn by a player during the series. Congrats to the Phils and for everyone else, it's only 4 months until pitchers and catchers report to Spring Training! 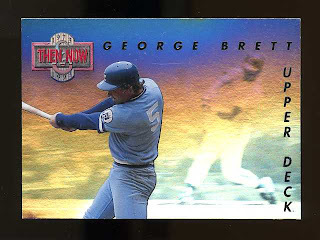 Growing up in Kansas City, my favorite player was of course, #5 George Brett. Sabermetrics guys will tell you there is no such thing as a clutch hitter, but after watching Brett play, I tend to disagree. George seemed to come through for the Royals in clutch situations on a nightly basis. The Royals actually had important games back then too. 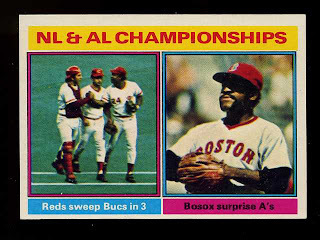 If you are under 30, you probably won't remember that, but from about 1975 to 1985, the Royals and Yankees battled for the AL Pennant on a yearly basis. One of my greatest regrets was when I got the chance to sell George Brett a computer. I was working at the local Gateway computer store, and George came in. He happened to be good friends with the owner of Gateway, Ted Waitt. I instantly recognized Mr. Brett and made sure I was the sales rep to take care of him. He ended up buying a top of the line laptop and almost every accessory you can think of. He then asked if I could set it up for him. Being young and stupid, without thinking I blurted out that all you have to do is plug in a few things to the back of the laptop and turn it on. This was indeed true, but I missed out on the opportunity to talk baseball one on one with one of the games all time greats. So George, if by some strange twist of fate you happen to read this, let me know the next time you need a computer set up. I'll fly to KC and set it up free of charge. Well, my only charge will be one great baseball story. Go Royals! I head out of town for a week (Austin, TX was crazy this weekend after the Red River Rivalry win, but that's another story) and the Rays keep on winning. This is the most amazing story since the Rockies won the NL pennant way back in 2007. 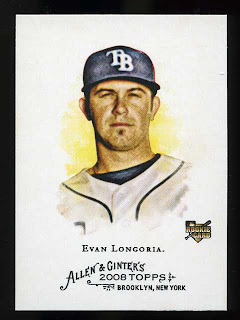 With the Rays up 3 games to 1, and leading 5-0 in the sixth inning of game 5, looks like Tampa Bay will filling out the right half of the 2009 version (2008 season) of the card below. Rays vs. Phils...don't think many predicted that matchup. I was in the post office a few weeks ago mailing some baseball cards out, and I noticed something very interesting. Normally, I don't pay any attention to the stamps that the post office is selling since I just use their automated machine and then get the heck out of there. But that day I had to go to the counter since I was mailing some cards to Australia (yes, there are baseball card collector's down under! ), and a set of their stamps caught my eye. 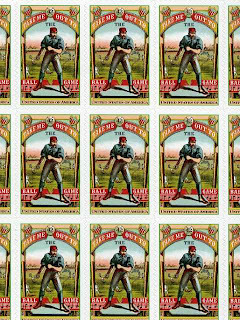 They are called "Take Me Out To The Ballgame" stamps and they picture a baseball player from the 1800's. Kind of reminds me of the original Allen & Ginter cards. The stamps look really nice, so I picked up a sheet of them. If you haven't seen them yet, I posted a scan of them below. Holy Cow! Congrats to Tampa Bay. Four more wins and you're in the World Series! Well, all four of the first round playoff series are 2-0 now. It's looking like the Tampa Bay Rays will be heading to the ALCS, four wins away from the World Series! I wonder if anyone predicted that at the beginning of the season. They do have to head to Chicago now to face the White Sox on their home field, so they can't celebrate yet, but they are playing well. Best of luck to the Rays. Cubs lost yesterday. White Sox lost today. Cubs are losing tonight 6-0. I love the city of Chicago. I love Wrigley Field. I'd love to see the Cubs win a World Series since it has been 100 years since they last won a World Series. It's not looking good this year though. Then again, the Red Sox came back from a 3-0 ALCS deficit a few years ago, so I guess there is still some hope. No matter what happens though, you've gotta love playoff baseball. 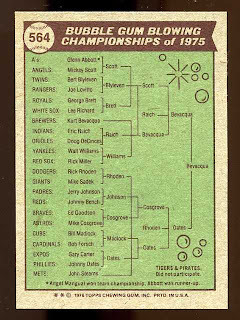 And thinking about the how long it's been since the Cubs won a World Series gets me to thinking about my all time favorite cards, the T206 cards. Here's a little vintage Chicago tribute. When a middle age man from Louisiana decided he wanted to make a quick buck by ripping off a couple of sports cards dealers, he got more than he bargained for. These sports card dealers didn't just file a police report, they went after the thief themselves! A little eBay detective work was all it took. It wasn't long before they spotted one of the stolen cards, a rare autographed Chris Paul card for sale on eBay. They put in a fake bid, won the card, and got the guys address by telling him they needed to mail him a money order. Maybe we should get these guys up to Washington to help out with this bailout fiasco. You can find more on this story at The St. Tammany News. Let's flashback to 2004. I was a sports card collector who was lost. Sure I still bought cards and sold cards on EBay, but it had been probably 10 years since I had opened a pack of cards. 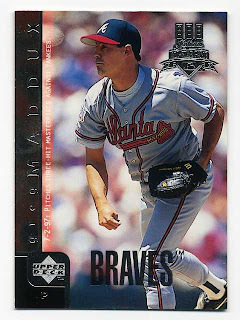 I was submitting a lot of T-206 cards to PSA for grading back then, so I was a frequent visitor to the great PSA (Collector's Universe) message boards. I ran across a small group of collectors who were raving about these Topps Heritage cards. Having been focused strictly on vintage cards at the time, I had never even heard of Topps Heritage before. But the concept struck something in me. The thought of current players on vintage style cards was very appealing. 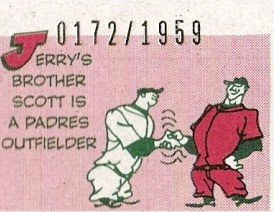 The 2004 Topps Heritage set was based on the 1955 Topps set, which happened to be one of my favorite Topps designs. So I hurried over to the local Target store and picked up a few blaster boxes (11 packs at the time, you bought 10 and got the 11th free) and I pulled the beauty below. And that was it--I was back in the wax pack game! You Paid How Much For a Common?